“Miraculous”, “superb”, and “absolutely impeccable”. These were the words that the English-language media used when Russian flautist Maxim Rubtsov debuted to discerning US classical music audiences in the early 2000s. But it was not just his superb talent and mastery of technical skills that allowed him capture the hearts of his audiences. 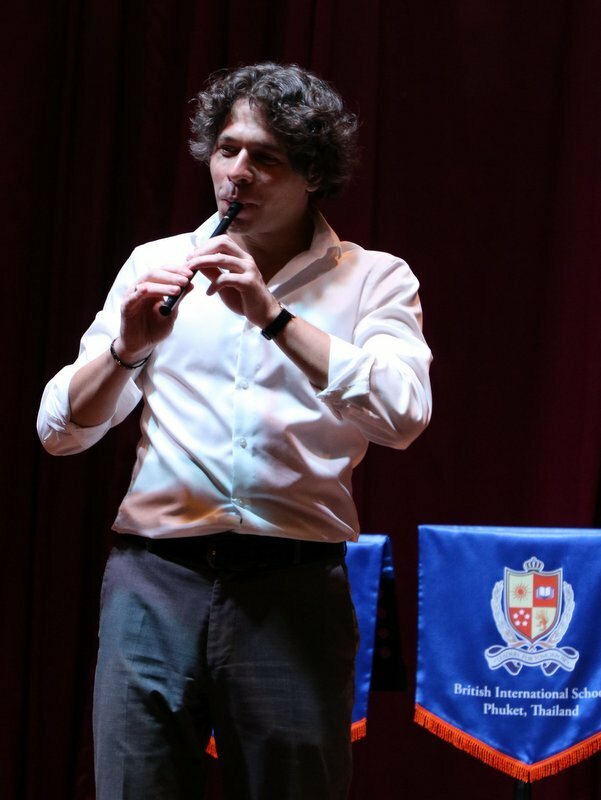 Virtuoso performer and natural teacher Maxim Rubtsov plays his flute during a recent visit to BISP. Maxim also played a recital at Royal Phuket Marina during his visit to the island. A virtuoso performer and natural teacher: Maxim enraptured students during his visit to BISP. 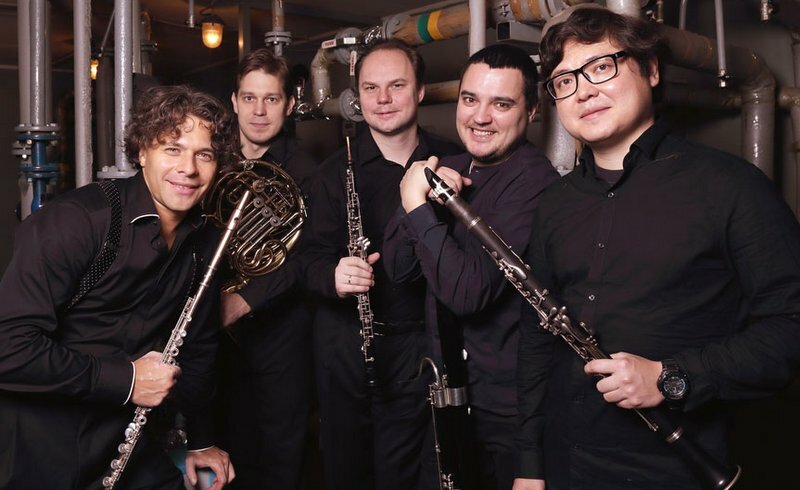 Maxim Rubtsov (left) is part of the Russian National Orchestra Wind Quintet. 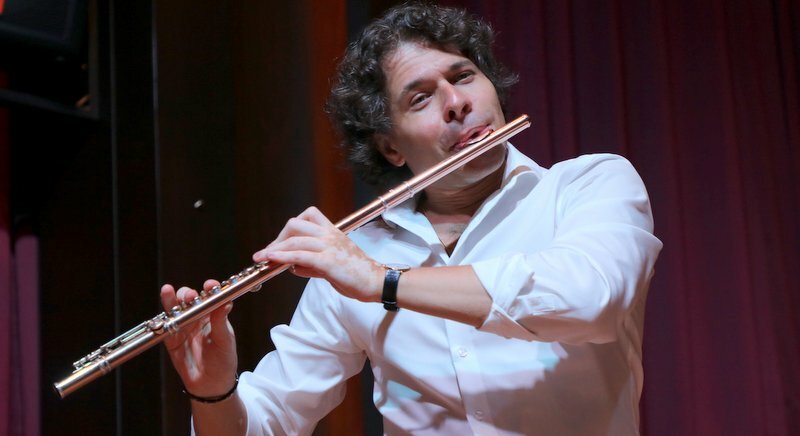 In addition to being in the highest echelons of virtuoso flautists of the modern age, Maxim also has an effortlessly disarming stage presence – his constant personal interaction with his audiences add a special charm that elevate him to be the best of the best. In a nutshell, Maxim’s performing style is a unique blend of top-level skill and informal banter with the audience. 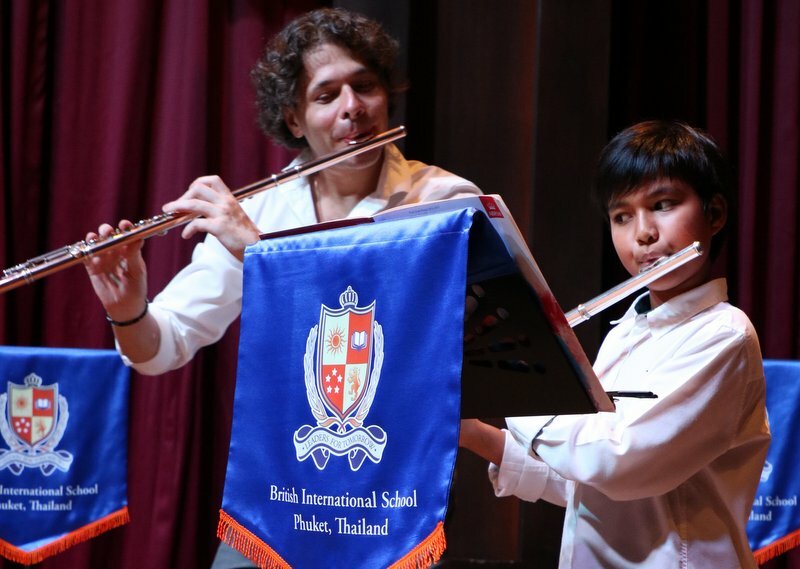 The Phuket News recently had the rare chance to witness Maxim both literally fly around his listeners while performing “The Flight of the Bumblebee” and then inspire them to clap and stomp along with his Irish whistle during a masterclass and recital at British International School, Phuket (BISP). His performance is a constant dialogue with the listeners in both music and spoken word, as he not only plays, but teaches how to ignite one’s imagination and encourages the audience to share what they feel. Born in 1977 in Bryansk, Russia, Maxim began to study piano aged five and only later did he pick up a flute for the first time and start taking lessons. At the age of 14 he transferred to Moscow’s prestigious Gnesin Academy of Music and had an epiphany – that playing the flute would be central to his life from that point on. “I started studying music seriously when I was 14, which is quite a conscious age. I discovered that I can produce real high quality sounds. I can open a score, read it and play, telling something very, very, very interesting. I just felt it and I must admit that “just feeling” is the only way this can happen. This moment in my life coincided with my entering a musical college in Moscow. Though that decision had already been made, but that’s how it happens in life: first you make a step without thinking about it in-depth and only later comes the understanding that this is exactly what you can do best. I felt it when I was 14 and still feel it now,” Maxim says. Maxim joined the Russian National Orchestra in 1999, and became the orchestra’s Principal Flute in 2003. He had his first tour abroad with no less than the San Francisco Symphony Orchestra for its July 2002 Russian Festival. 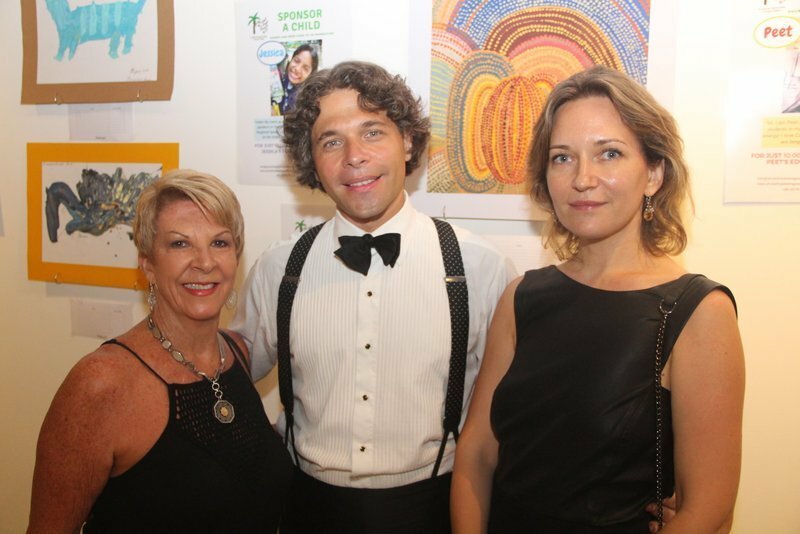 Since then Maxim has toured through numerous US states and European countries, charming music-lovers around the globe with the sound of his flute. In addition to his extensive orchestral work, Rubtsov regularly performs in chamber ensembles and explores jazz and other genre-bending compositions. “I try to design an interesting program for each performance, but music is something happening on the spot. For instance, before this concert I was asked what I was planning to play and I gave a list of musical pieces to be played. "But having entered the BISP Auditorium, seeing the place, the audience, all these amazing kids and teachers, I changed plans and played an absolutely different set of musical pieces. Frankly, I don’t think I made a mistake,” Maxim says. 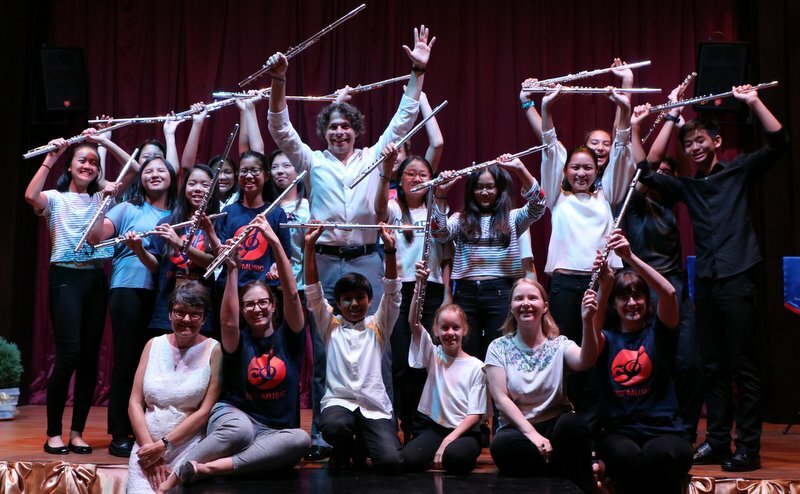 At BISP Maxim not only played for children, but also alongside some of the up-and-coming FOBISIA flutists, sharing his professional insights and visibly enjoying the process. “I believe I succeeded in finding a common language with each of the kids, and with each of them we played something very precious to me,” he says. How does it feel to play for children after having sold-out events at some of the world’s top recital halls? Maxim’s answer can be a little surprising. “I believe it’s much more interesting to play in front of kids actually, as many of them hear this type of music for the first time in their lives. It’s far more difficult to spark an interest in kids rather than in a prepared audience. You need all your charm and all your wits in order to play the piece – and deliver what you’ve got to say,” he says. This approach certainly seems to work, as kids and adults alike readily accepted Maxim’s invitation to become his co-creators. When asked if it possible to get this level of feedback from a regular adult audience, Maxim answers in the following way. “Of course it is. Absolutely everything is possible because there is always a child inside of any adult, so jokes from the performer and teamwork with him are something that any audience accepts. The aim of any concert is to have fun and gain some great memories." Breaking stereotypes of classic music being a boring affair is one of the goals that Maxim sets for himself as a teacher. “I would love BISP kids to keep the memories of this day (or rather night). I would love them to remember that stories can be told not only with words, but also in this way and it may even be more interesting. I would love them to remember that classical music doesn’t need to be all serious and boring like an old dusty book one has to struggle with. "I would love them to see that they can blow away the dust, open the book and find amazing worlds waiting for them. You dive into it and you are in forever,” he says with shining eyes. One of Maxim’s teaching secrets is his ability to find an individual approach with every child. “The most important thing is not to destroy the natural desire to study. It’s the teacher’s job to find individual approaches to students and get everybody interested in music, and asking for more, so the story will never end. You need to find exciting stories and deliver them in the most interesting way. It’s all in the teacher’s hands,” Maxim says. 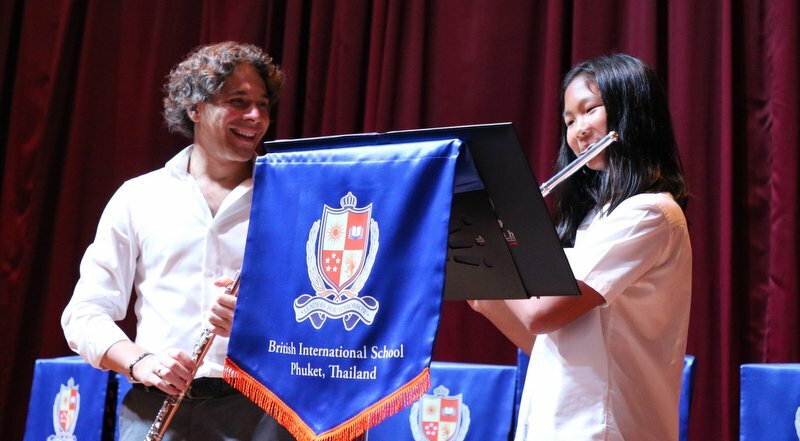 Maxim hopes his performance at BISP changed the way children view the flute and orchestral music. At the same time, the show changed Maxim’s view of Phuket as he had a chance to look beyond the “world-class beach destination” stereotype. “The impression is now manifold, deeper and more complex, as I had a chance to see a real epicentre of knowledge and positive energy, feeling the minds of the kids. I’m excited that such a place exists, because of the crucial role that education plays in our lives. This place is an example of education at its top level. "And the fact that all students also learn to play makes it even better, as nothing can beat musical studies as a tool to develop ones perspective and horizons,” he says, adding, “actually, teaching kids and passing my knowledge to future generations is the most important thing for me. It feels like I’m operating a time machine,” says Maxim.